Another design integrates both Japan and traditional China styles into one. The curve type is from the manual fan of old China. It can use even in any craft shop to have more art feel. Or decor the home to have multinational feeling and let more elements running inside the home. 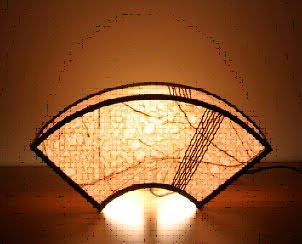 The materials are made with bamboo and paper materials cover. Such materials make the visual effect of getting the mild and misty lights. Which is typically good for the night time in the room.